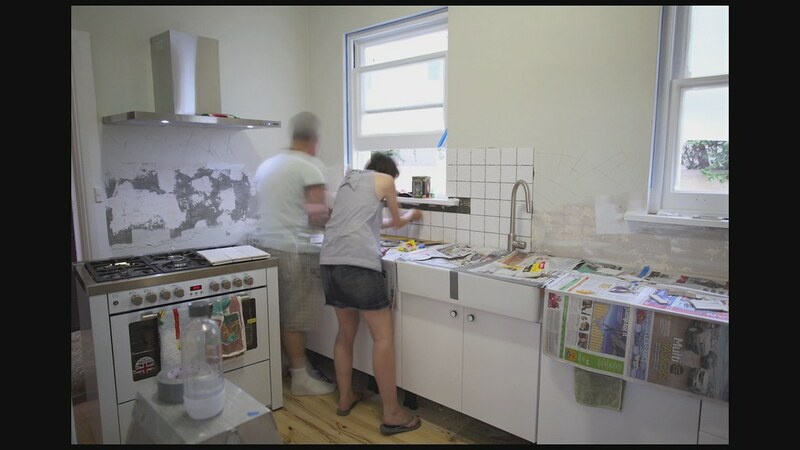 You have seen so far that our kitchen reno is a complete DIY project, so it would come to no surprise that Denis and I decided to tackle the tiling too. Having never done tiling before, it was a wee bit scarey, but once we got into the groove of it we actually found it to be really enjoyable! I am pleased to say we would be happy to tackle another tiling project again sometime - maybe upstairs bathroom!It is amazing how much money you can save if you give it a go yourself. The tiles cost about $130 + grout, cement and spacers. It was a tricky job as the wall wasn't so even, plus we had to go around the windows and sills. But overall we are pretty wrapped with the outcome. First thing I noticed is how the white tiles make the wall colour (Dulux Pale Tendrill Half) simply POP! We did the laundry as well and now both rooms look almost finished. Final before and after pics are on their way!